Several of the poshist "pet lifestylists" were featured in the 2007 Second Annual Pet Fashion Week last week in New York City. Designers of bedding, clothing, carriers, jewelry, hairstyles, and even fragrance for pets were represented, but the only pets on the catwalk were dogs. 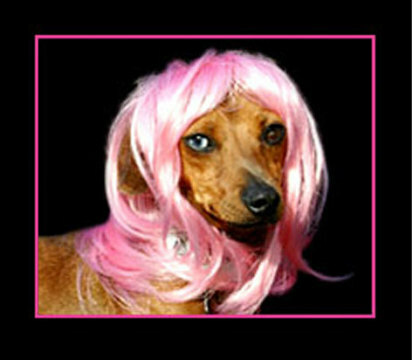 Reportedly, the dogs wearing wigs by Total Diva Pets were the absolute show stoppers! 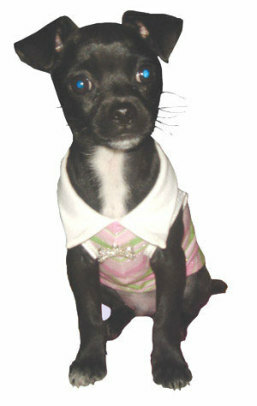 At this writing the grand prize winners have not been announced, but I checked out the designers in contention, and thought I'd share some of their "dog"alog fashions with you. 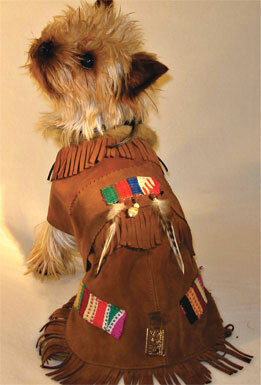 Manfred is the Yorkshire terrier model and namesake of the company. Manfred of Sweden (MOS) clothing are delicately crafted works of art that have been displayed by design museums as well as dogs of the rich and famous. 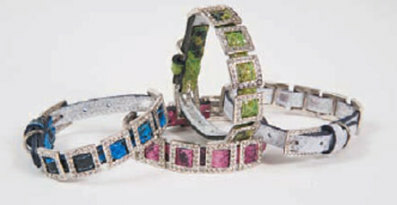 All items are special ordered and custom -made; no prices are revealed on the website. 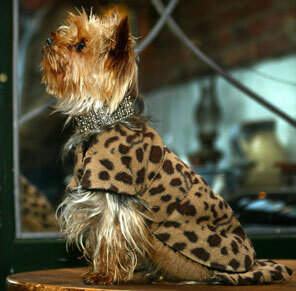 My silky terrier instantly fell for Manfred of Sweden's (MOS) leopard jacket and the gorgeous pearl and silver collar, but since we live in the southwest, he decided that the Indian suede jacket would be more appropriate. 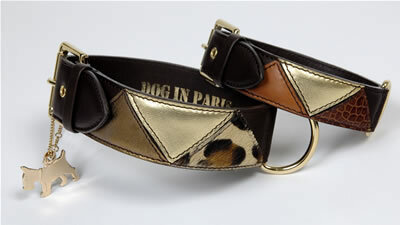 Another very exclusive designer of dog attire, Dog In Paris, creates collars, leashes, carriers, sweaters and coats. The very sweet sweater below is handmade to order for about $116. Dog In Paris gets its inspiration from women's fashions of the season, and posts those fashions on its website so you can coordinate your own wardrobe with your dog's. This fashion dog house will also make your own custom designs! 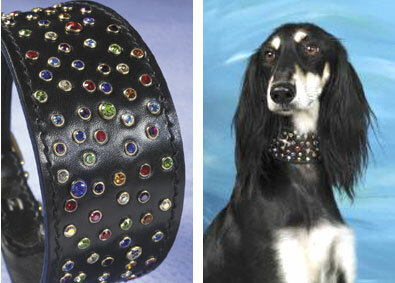 Bling's the thing in dog collars and leashes, and Swarovski was a big sponsor of Pet Fashion Week this year. 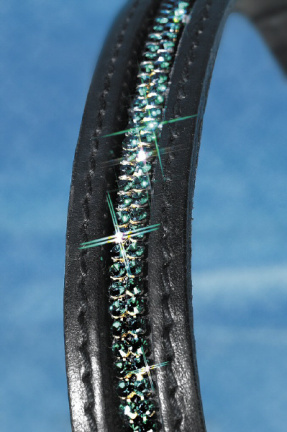 When the choice is between diamonds and crystal, remember there are some beautiful crystal-studded collars that can be had for around $200. Take this fine tapered collar fromGreat Britain's Diamond Dogs Ltd.; it's one of the many brilliant collars Diamond Dogs makes. 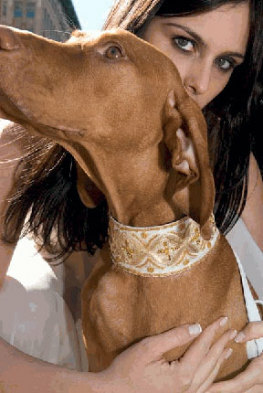 Malucchi, in fine Italian style, makes exquisite collars, leashes and carriers, in addition to a clothing line for pets. 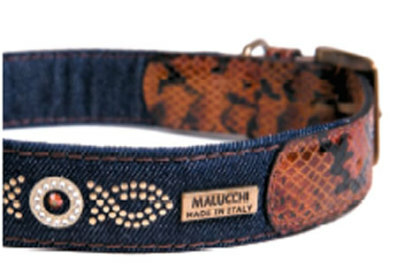 You'll find many examples of Malucchi's work at DJ Pets, a distributor of Malucchi and other European pet fashion houses. This Hollywood designer is fashionista to the stars' dogs. (Paris Hilton shops there too.) 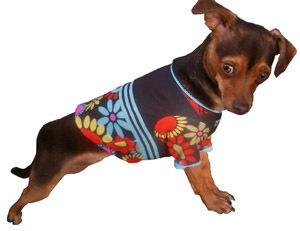 When you take a look at the array and originality of the Hip Doggie designs, you'll know why it's so popular. The clothing - - a large selection of sweaters, vests, tees, polo shirts, tanks, sportswear, and dresses - - makes you want to invest in a wardrobe and chest of drawers for your pooch. The stuff is hip and affordable, so if I were going to splurge on my silky terrier, I would do it here. Better yet, where can I find clothing like this for me? 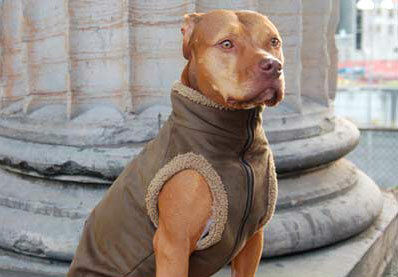 Another American designer from the west coast, Idawg specializes in clothing for larger dogs. 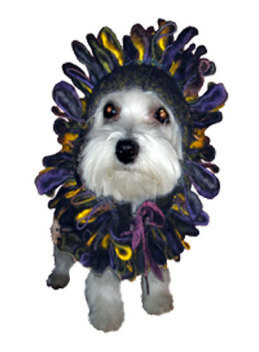 It's practical clothing, intended to keep short-haired dogs warm in the winter, but the styling is impeccable and very sharp-looking. From the Hamptons of Long Island fame, comes dog fashion that's just what you'd expect -- preppy as a Ralph Lauren Polo and a pair of Gucci loafers. 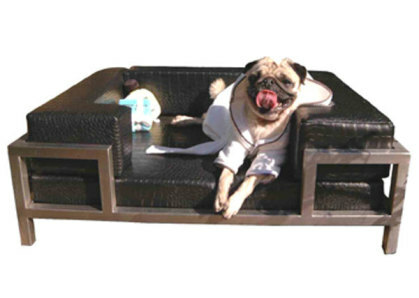 Dress your dog here, and he'll look like "old money" ... guaranteed. Hampton Hounds (HH) has an exquisitely made selection of leather collars and neck jewelry, as well as clothing, guest soaps, carriers, and posh relaxation spots for your dog. HH even has a bridal section for your dog! 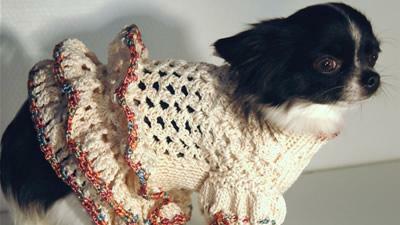 Though pricey, dog fashion is still on the affordable side for special occasions at HH. Except... well, the bed below is listed at $1,750. It wasn't just the doggie wigs that drew attention at the 2007 Pet Fashion Week events, but the natural fur-styles that dog models sported at the Pet Fashion Week. Sathit Suratphiphit, from Thailand, is a dog groomer and teacher. His school has received 33 national and international awards for grooming. The styling, though it may not suit your own dog, is truly creative, and I recommend you visit the Starwood Grooming Center to look at its gallery. If the stuff I've shown you hasn't blown your mind, these photos will. If you enjoyed this article, please DIGG or REDDIT or vote for it on another popularity link shown below. Your vote is my reward. Thanks! Notice: This article is the specific work of the author and is, therefore, the copyright of InventorSpot.com. If you use any of our information, please link to this article on InventorSpot.com as your "original source," or prepare your work directly from information made available from the retailer. but you know the dogs HATE it.